Demand that news outlets stop using code words for "racist!" 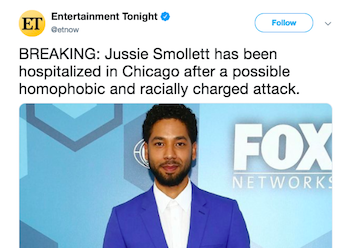 Early Tuesday morning, beloved actor, musician, and activist,Jussie Smollett was attacked at a Chicago Subway by two men who shouted racist and homophobic slurs along with “This is MAGA country” as they viciously beat him, tied a noose around his neck, and poured bleach over his body. As we send prayers and healing toward Jussie and his family, it is clear that for those living at the intersection of Black and LGBTQ identities, discrimination and violence is compounded. That's why we are demanding that mainstream media stop the euphemism of this brutal attack. News outlets like Entertainment Tonight and NBC News have refused to be clear and integral in their reporting; insead choosing to soften these vicious acts as “racial” or “racially charged”, instead of calling them for what they are: racist and homophobic. We're demanding that you avoid using phrases like “racially-charged” and “racially-tinged” when referring to explicitly racist acts. Euphemisms for racism serve a dual function- they allow you to avoid offending your conservative readership while giving people and institutions who propagate systemic race-based discrimination a way to avoid the claim of racism.